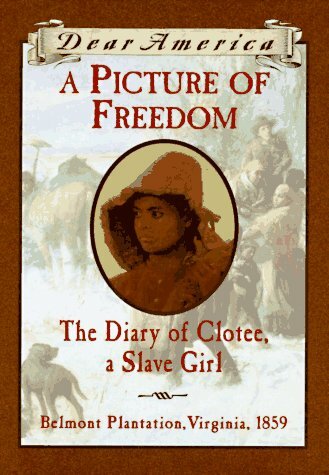 A Picture of Freedom: The Diary of Clotee, a Slave Girl by Patricia McKissack. Scholastic, 1997. Currently Available. Face Value: The old cover – the one I remember from childhood – has all of the hallmarks of a great Dear America book cover. The portrait on the front is from an old painting. A Picture of Freedom was one of the original Dear America books re-released with the series update. The new version has a cover that is much less appealing to me. I find that the new portrait of Clotee feels too contemporary. She looks scrubbed clean and fresh when I picture Clotee as someone who is careworn and exhausted, yet still strong. I miss the historical feel of the images pulled from older paintings. Does it break the slate? Yes, and in one of my favorite ways – a young woman secures her identity and finds a way to change circumstances through literacy. Clotee covertly learns to read and write, and she uses this powerful but dangerous knowledge to aide the people that she loves. Who would we give it to? Well, we’ve already discussed how this series appeals to girls in early and mid elementary school – especially those with a penchant for historical fiction. 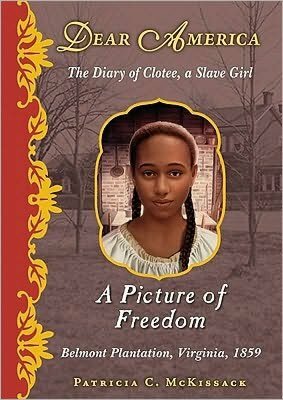 Clotee’s story would be a good addition to other readings about slavery and life on Southern plantations. Because this explores slavery from a girl’s perspective, it might be nice to pair it with something like Jefferson’s Sons by Kimberly Bradley. Clotee’s perspective is a unique one, exploring the differences between the duties of slaves who worked in the house and slaves who worked in the fields. Review: As a young girl in slavery, Clotee has had to develop a tough, resilient personality. Her family was ripped apart, so she has cobbled together a support system among her friends and loved ones on the plantation. As a slave who primarily works in the big house on the plantation, she has had the opportunity to eavesdrop on the children’s lessons while she fans them. Clotee is a bright girl and she has managed to learn to read and write enough to keep a very secret diary. She is terrified that if her literacy skills are discovered, she and her loved ones will be beaten, sold – or worse. Given the conditions and the treatment of slaves at the time, her fears are warranted. Every time Clotee writes in her diary, she is toying with danger. There is an element of suspense in this book that raises the stakes and made it exciting to read. When I read this book in my childhood, I admired Clotee’s bravery. Re-reading as an adult, I questioned the plausibility of the story’s premise: if Clotee was just learning how to read and write, how does she have the fluent vocabulary to describe all of the aspects of her everyday life? It is powerful to read about the impact that words have in Clotee’s life, but as an adult I found Clotee’s story to be sanitized. Yes, she sees some awful things, but this book offers an almost mild depiction of slavery. Extreme violence is alluded to, but Clotee does not always see it happen or experience it for herself. I don’t know what I was looking for as an adult reader – certainly nothing that would traumatize young readers – but perhaps a less gentle depiction of what were no doubt abhorrent living conditions. What’s exciting about revisiting this book in adulthood is that I have a better understanding of the power of literacy, thanks to many university courses relating to Paulo Freire’s work. The philosophy of literacy as an empowering skill set is a major part of Clotee’s story. Like Matilda and many other great female characters in literature, Clotee uses the ability to decode meaning in letters as a tool for self-actualization. That’s something that girl readers at any age can get excited about. I liked it as a kid, and I loved it as an adult. This entry was posted in Middle Grade, Reviews, Theme Week and tagged Dear America, Historical Fiction, literacy, Patricia McKissack, Scholastic, slavery. Bookmark the permalink.